↑ "ISU World Standings for Single & Pair Skating and Ice Dance : Men". International Skating Union. 4 February 2018. สืบค้นเมื่อ 17 February 2018. ↑ "ISU Judging System - Season Bests Total Scores 2016/2017: Men". International Skating Union. 22 April 2017. ↑ "ISU Judging System - Season Bests Total Scores 2015/2016: Men". International Skating Union. 2 April 2016. ↑ "ISU Judging System – Season Bests Total Scores 2014/2015: Men". International Skating Union. 18 April 2015. ↑ "ISU Judging System – Season Bests Total Scores 2013/2014: Men". International Skating Union. 24 January 2013. ↑ "ISU Judging System – Season Bests Total Scores 2012/2013: Men". International Skating Union. 13 April 2013. ↑ "ISU Judging System – Season Bests Total Scores 2011/2012: Men". International Skating Union. 31 March 2012. สืบค้นเมื่อ 16 April 2012. ↑ "The Greatest Figure Skater Ever Is Michael Jackson on Ice, Surrounded by Winnie the Poohs". New York Times. 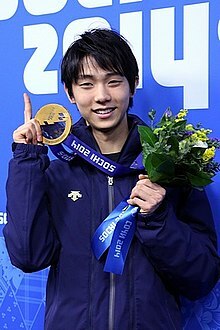 ↑ "Is two-time Olympic gold medalist Yuzuru Hanyu the greatest figure skater of all time?". Washington Post. ↑ 12.0 12.1 12.2 "Progression of Highest Score, Men, Short Program Score". ISU Results. International Skating Union. 22 April 2017. สืบค้นเมื่อ 22 April 2017. ↑ 13.0 13.1 13.2 "Progression of Highest Score, Men, Free Skating Score". ISU Results. International Skating Union. 22 April 2017. สืบค้นเมื่อ 22 April 2017. ↑ 14.0 14.1 14.2 "Progression of Highest Score, Men, Total Score". ISU Results. International Skating Union. 22 April 2017. สืบค้นเมื่อ 12 May 2017. ↑ Zaccardi, Nick (12 December 2015). "Yuzuru Hanyu breaks world records, three-peats at Grand Prix Final". NBC Sports. ↑ "Yuzuru Hanyu (JPN) performs first clean quad loop in competition" (PDF) (Press release). International Skating Union. 16 October 2016. ↑ "Student Spotlight". Waseda Weekly. July 28, 2014. ↑ "Figure skaters recall odd gifts from fans | OlympicTalk". สืบค้นเมื่อ 2015-09-12. "Ten kids cleaning the ice after wildly popular Olympic/World champ Yuzuru Hanyu skated". Twitter. สืบค้นเมื่อ 2015-09-12. ↑ 20.0 20.1 "Competition Results: Yuzuru HANYU". สหภาพสเกตนานาชาติ (International Skating Union). หน้านี้แก้ไขล่าสุดเมื่อวันที่ 11 มกราคม 2562 เวลา 22:25 น.